Happy Monday everyone! I hope you all had a wonderful weekend. Thanks to those who came to the blogger market on Saturday. We had such an amazing turn out, and it was so fun to meet some of you! Today’s look is a color combo that has been on repeat for the last several months. I seem to gravitate toward this color combo more than any other right now. It’s simple, chic, and sophisticated. What color combos are you loving right now? 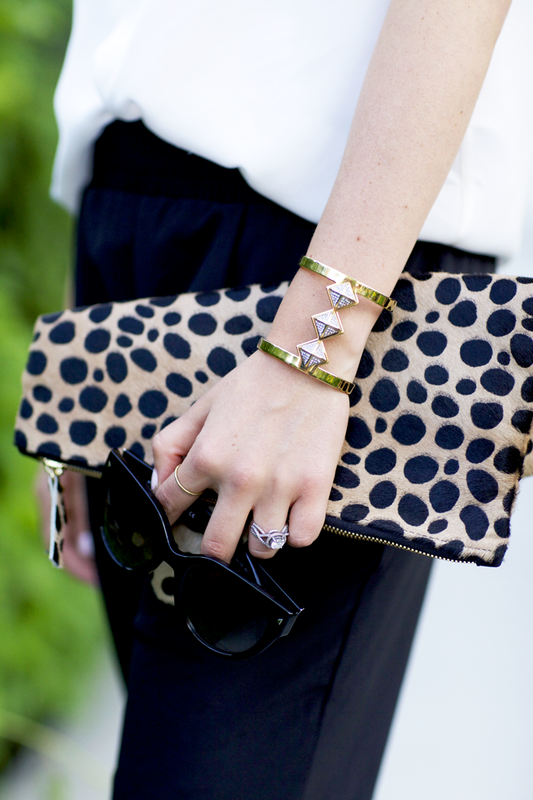 That leopard clutch is really cool! Loving your hairstyle, very nice! You look amazing! Black and white is always on top! Gorgeous! Love the balance between casual and dressy in this look ! loving those pants – am totally going to purchase right now! I just got these same pants this weekend! I love them, so comfortable and chic! Adorable black and white look. Love the heels. I don’t know if I could ever pull off those pants but they look so great on you! Loving your flats too! I am in love with those pants! I must get my hands on them! love your pants dear !!! I too love black and white but I also like mixing in bold colors with black and white such as purples reds and pinks, love the pants! one of my favorite looks of yours Rachel! Will you be at NYFW? I’ll be there from the 8th-10th and would love to get coffee and catch up! I love a black and white combo, too— especially when paired with a pop of color or pattern, like you did here with your clutch. Loving your pants and shoes! You rock that look girl! That pants are amazing. Great style. I can’t get enough of gray. I love it with just about anything, but I’ve been attracted to blues more than ever recently! Wow one of my favs on you! You look so chic! If I wasn’t pregnant I would totally rock those pants!! The loose fit of those pants is fantastic! Adore that cuff bracelet! Love this look and I couldn’t agree more about the black and white combo. It is the first thing I reach for when I’m in a rush or don’t know what to wear. I too often pair it with a hint of leopard. It is always chic and sophisticated. Black and White looks are always a good bet. The bag pattern gives the look a special touch. Love these pants. I have them as well. So comfortable but can be glammed up so easily! I love this outfit! I’m dying for some pants like those. So chic! I love this outfit Rachel! Those pants looks super comfy and you still look chic and pulled together. So gorgeous, Rach. I’m also a fan of the black and white classic combo. LOVE your blog and all your outfit posts! This outfit is sheer perfection. 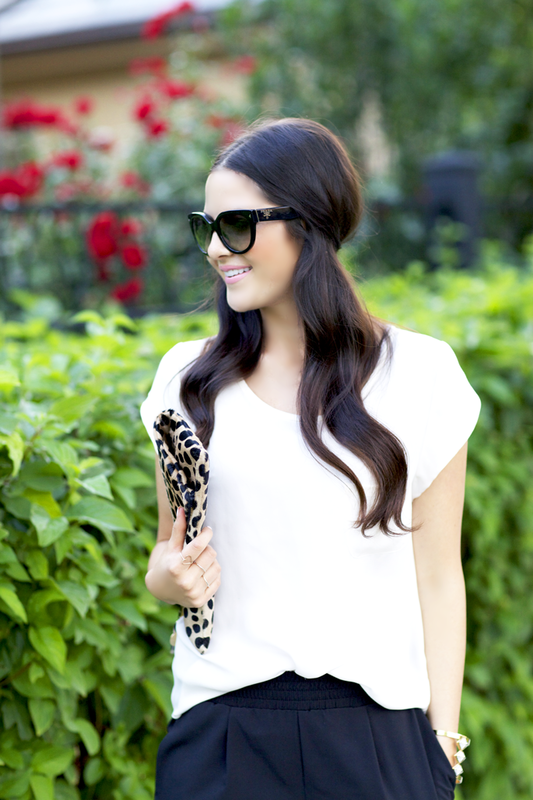 Black and white is so classic and I love the modern twist with the slouchy pants and leopard clutch. This has given me inspiration for my next date night with my husband! I love this outfit! Looks great on you! LOVE this look! want those pants so bad! Love this more casual but glam look. That cuff is really pretty! I am obsessed with your pants! So chic, Rach! I would love it if you checked out my blog, I recently posted my engagement photos! I adore this casual chic look! Love those pants so much! The black and white look is so classic. I love it when added with a touch of leopard, like your Clare Vivier clutch, a pop of red or hint of neon. This is one of my favorites, Rach! Love the way you did your hair here! Also love the casual outfit paired with heels! I’m in love with this whole outfit – that clutch has been on my wishlist foreverrrr. LOVE IT! I look into my closet, and all I see is black and white! I dedicated an entire week to outfits based on those colors for my blog! It is just so simple and easy when you are rushing in the morning, and it makes shoes and accessories that more exciting! Love a great dressed up sweatpant look! I love your shoes and bracelet. This outfit looks so timeless. I’m loving the grey, white and heathered beige. I love any loose fitting tees. They make me feel so skinny! This is such a pretty chic look!! You look amazing! Timeless and classic! Never can go wrong with black and white! I love the neutral colors together! Such a great timeless look. Your hair looks gorgeous! your hair is looking absolutely perfect in this post! also i am really loving those slouchy pants. you wore some cobalt ones a few weeks back and began my love affair with them. i may need to get my hands on a pair! Love the look!! esp those shoes! Absolutely in love with this outfit. I love slouchy pants lately, and you pull them off perfectly! Love your hair like that! And those pants are SO cute!! those pants are awesome! and how do you get your hair to be so shiny?! it’s gorgeous. Those shoes are so great on you, especially with those pants. I picked those up from Nordstroms and one of my favorites! I seriously want your clutch! Such a cute outfit. Such a cute look! In love with your heels and clutch! Love this look! So chic. I’ve been on a black and white kick lately as well. It’s just so easy to wear and fun to accessorize! Love this look! So chic! I’ve also been on a black and white kick lately. It’s so easy to wear and fun to accessorize! Love the black and white + leopard! The pants look so chic yet comfy. i love your hair like this– so so cute. & also love the vince heels…. i’ve been wanting those since i saw another blogger purchased them. Love those pants! Such a great look. Thank you for sharing! Love the way you styled this – so simple and lovely! Wow! Can we get a hair tutorial for your hair in these pictures? LOVE.